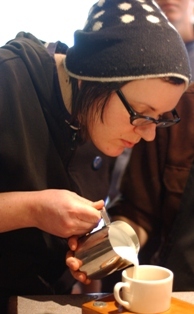 On February 15th-17th, Emily and Braden will travel to Washington, DC (with Amy as support) to compete in the 2008 Mid-Atlantic Barista Competition as part of Coffee Fest. They will compete against other baristas representing Maryland, Delaware, DC, New Jersey and Pennsylvania. They will face 7 or 8 judges who will evaluate them on their technical skills, espresso preparation, milk steaming, drink preparation, presentation and a signature drink. Emily and Braden must discuss and prepare 12 perfect espresso drinks for the judges in 15 minutes! 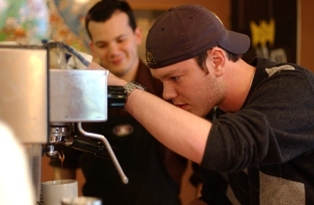 At Tazza D’Oro we are not attached to where they place in the competition but we are attached to Emily and Braden having one of those memorable “life experiences” – connecting with other coffee professionals and to hopefully see their skills as valued and marketable in the world. Once again our coffee roaster, Batdorf and Bronson has stepped up. We have spent countless hours on the phone with Oliver Stormshak for tips and training. They are working on a “special” espresso blend with Braden that is so freaking delicious that we may carry it along with the Dancing Goats as another house espresso. And Margret, from the Batdorf and Bronson Roastery, in Atlanta will spend a couple of days in the “burg” to help Emily and Braden practice their routine. But the best part so far has been when folks from Aldo Coffee came to practice and help. This past Tuesday, Melanie and Rich Westerfield, owners of Aldo Coffee and their 3 great baristas – Belle, Sonya and John came to Tazza D’Oro. Eureka! Coffee community at last. Rich, Melanie, Rachel (our manager) and I shared espresso bar/business experiences (and a few IPAs) while Belle, John and Sonya walked Braden through the elements of barista competition. What a great night – community, peer networking, barista professionals helping the competition take it to the next level. Now that’s what we are attached to! Batdorf and Bronson – you are the definition of cool! Emily and Braden you make us all proud and we a routing for you. Thank you Aldo Coffee. GO PITTSBURGH BARISTAS! Amy, You're too kind. Thanks for letting our folks work with your kids and have at the GB5. It's great for our team to work with others - we always learn something. But mostly we're delighted you've got a team participating - it will be an experience they'll enjoy. We'll be rooting hard for Braden & Emily. There's going to be a pretty decent sized Pittsburgh contingent for the show - hopefully they'll all be in the stands at the competition and showing some Pittsburgh pride! Good luck to you all! I am so excited you are competing. We love you too Amy & Tazza staff!